Pensioners pictured at a protest against budget cuts which affect the elderly Tuesday afternoon, Oct 22, 2013 at Leinster House. Video and pictures by Nick Bradshaw. 22.10.2013. See the position of éirígí on the Fine Gael/Labour assault on young people: here. 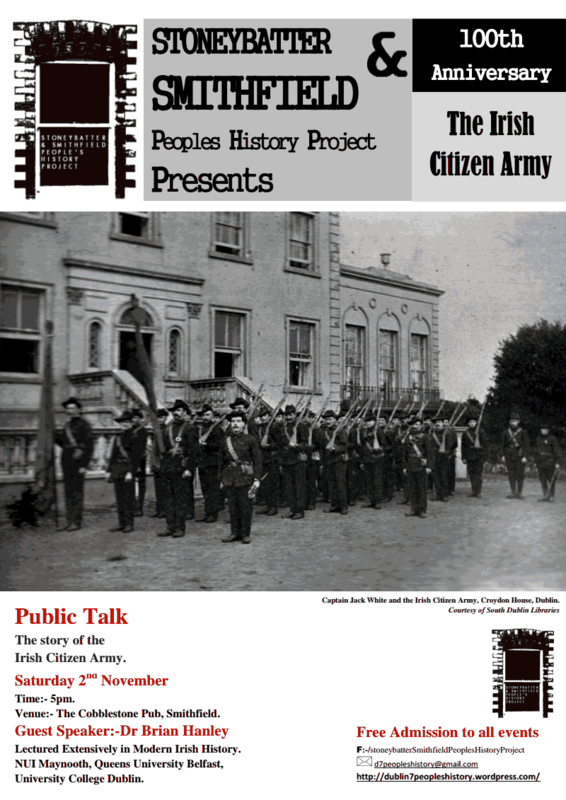 The next public talk organised by the Stoneybatter & Smithfield People’s History Project takes place on Saturday 2nd November at 5.00pm in the Cobblestone pub, Smithfield and marks the 100th anniversary of the founding of the Irish Citizen Army.The Irish Citizen Army was founded in November 1913, almost two months after the commencement of the Lockout. During the early weeks of the Lockout the Dublin Metropolitan Police brutally attacked workers on the streets of the capital and two workers died as a result of injuries inflicted by police. The ICA armed itself with hurls and batons and its primary role was to protect marches organized by the ITGWU from police attack. 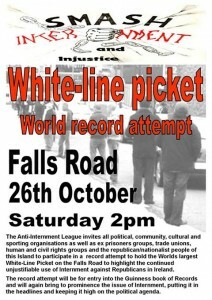 The Anti-Internment League is inviting all political, community, cultural and sporting organisations as well as ex-prisoners groups, trade unions, human and civil rights groups, democrats, republicans and socialists, and individuals concerned about detention without trial to participate in an attempt to hold the World’s Largest White-Line Picket, this Saturday (October 26) on the Falls Road. 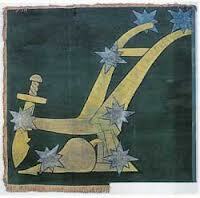 The picket is to highlight the continued use of internment against republicans in Ireland. The record attempt will be for entry into the Guinness Book of Records with the aim of putting the issue of internment in the headlines and keeping it high on the political agenda. 1968 was a very turbulent year. Obviously it was a turbulent time in Ireland. As the October 1968 civil rights march was taking place in Derry, athletes were preparing for the 1968 Olympic Games in Mexico. The Games were controversial because of the repression directed a couple of months earlier against protests in the centre of Mexico City. 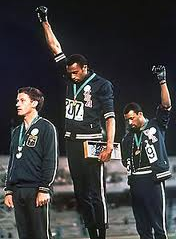 The Olympics also saw a stand against racism taken by the three medallists (two black Americans and one white Australian) on the podium after the 200 metres race. Light years ahead of the gas-and-water socialists. Interesting to see that the chairperson was Ursula Ní Shionnáin, a prominent member of éirígí and the main speaker was Sean Doyle, a comrade of Costello’s who is now a member of Clann éirígí. The full-on embrace of Costello by éirígí over the past couple of years has been a very encouraging development, indicative of the fact that éirígí has no interest in building a Provos Mark 2 politically but, rather, is focused on building a hard-core socialist-republican movement. Also, good to see that the main commemoration in Newtownmountkennedy featured both éirígí and IRSP speakers.